Each suite or room of our Bastrop, TX bed and breakfast is outfitted with all the amenities a vacationer or business traveler would desire, such as a new comfortable bed, refitted for the antique bed suites with luxurious linens and featherbeds, TV/VCR's, ceiling fans, coffeemakers, comfortable working/reading areas with desks, easy chairs and books and magazines. Some rooms have fireplaces, loveseat sofa beds or adjacent sitting areas. 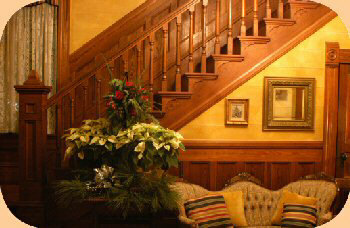 Downstairs are traditional Victorian front and back parlors with fireplace, TV/movies, games, and bookcases.